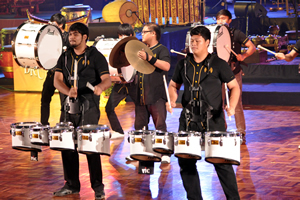 BANGI, 30 Nov, 2012 – Hundreds of music lovers were enthralled by the performances of eight teams from six countries who literally drummed up support when they showed their skills at The National University of Malaysia’s (UKM) International Drums Festival 2012. 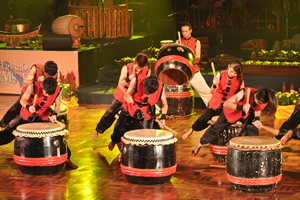 UKM was one of three Malaysian teams that took part, while percussionists from the Philippines, Thailand, Indonesia, Vietnam and Ecuador also provided the entertainment. Besides UKM, the other Malaysian teams were from Universiti Utara Malaysia and Voice of Percussion, a rebana group. The international flavour was provided by Sekolah Tinggi Seni Indonesia, De La Salle University of the Philippines, University of Economics and Business Vnu Hanoi from Vietnam, Phetcharaburi Rajabhat University of Thailand and Ochun from Ecuador. Present at the concert were the Deputy Vice Chancellor (Students and Alumni Affairs), Prof Ir Dr Othman A. Karim and renowned national music virtuoso, Dato’ Dr Johari Salleh, who is also principal fellow of the UKM Cultural Centre. The International Drums Festival held over three days here last week was organized by the Centre and the Student Services Department of UKM. The festival comprised of three main activities consisting of Workshops, Cultural Performances and a Cultural Trip. The festival was planned to capture the essence of the cultural heritage; its influences and development in order to promote better understanding and appreciation on the World Heritage Culture. Among the highlights of the show were the vibrant beats of the team from Ecuador, who combined African rhythms with Central American flavor. The festival provided a rare opportunity for youths and students, especially those attached with arts and culture, to complement their studies and personal interests. To achieve the festival objectives, each group nominated between 5 to 10 persons to join the festival. The participants were those who have interests in music especially percussion and able to perform the music of their countries. 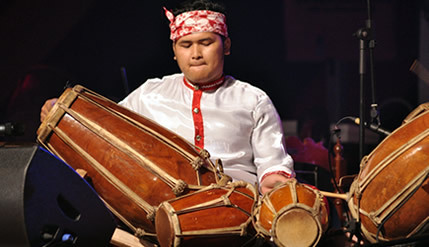 Each participating group is required to prepare a 10–minute performance based on their own culture. Those taking part took care of their own international traveling expenses. 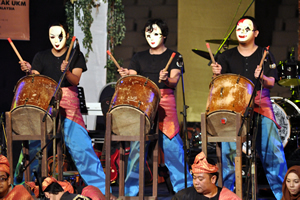 The participants were also asked to bring their own costumes and traditional music instruments. Participation was free with UKM providing board and lodging, domestic transportation including to and from the airport and cultural trips. The overseas visitors arrived in Kuala Lumpur on Nov 22 deparing four days later.